An orange glow signals the start of a new day, beyond a waterfall spilling over the edge of the plateau. We’re a few kilometres from the nearest village, Anivorano, and yet I can see nothing but tall grass stretching for kilometres around. I doubt many people have come this way before. Thirty trail runners – who up until last night had never met before – are sleeping in a row of army-green tents. A red and green banner marks the start of the Ultra Trail Madagascar: a six-day, 150km stage race in one of the most remote regions of the world’s fourth-largest island. We’ve all travelled a long way. I flew from Cape Town to the capital, Antananarivo. 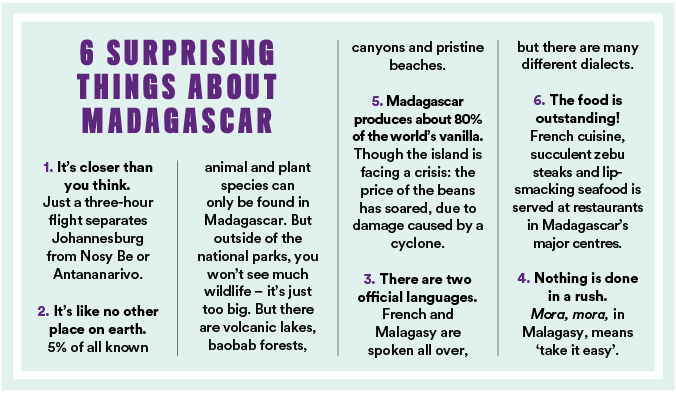 Then, from the window of a domestic flight to Diego Suarez, I began to understand how enormous Madagascar is. It was like flying over the moon: a desolate landscape sprawled between the city in the centre and the far north, where nothing grows or lives. A three-hour drive in a 4×4 followed, from Diego Suarez to the first camp – and with it, my first taste of the ‘roads’ in rural Madagascar. Last night we were shown to our tents, and meat and white rice were ladled onto tin plates. When the runners sat down to eat, their human stories began to emerge. 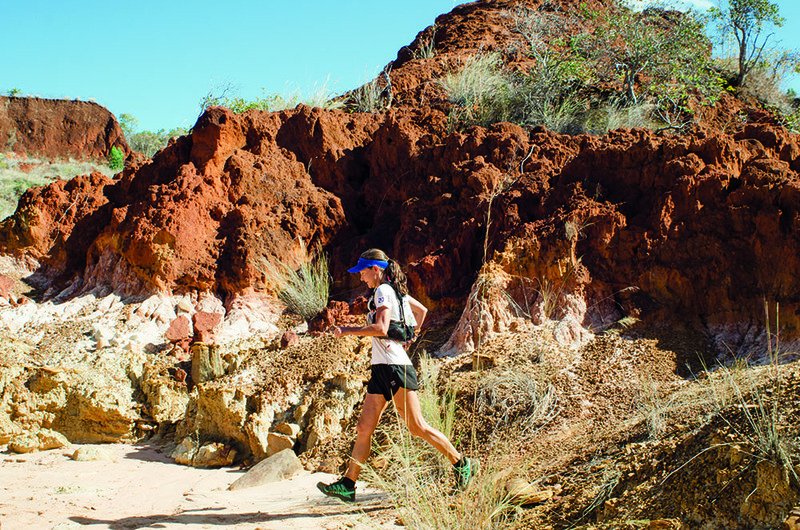 South African trail-running power couple Christiaan and Landie Greyling have made a career out of competing in endurance races all over the world. Dan Betts (44) is a bearded high-school chemistry teacher, originally from the US but who recently moved to Zambia. During the late 90s, Dan served in the Peace Corps in Thailand, where he became comfortable with being uncomfortable. Cockroaches were par for the course, and he once single-handedly removed a nest of rats from underneath his bed. It was there he participated in the Black Marathon, a 12-hour overnight run. Isabella De La Houssaye (53), from New Jersey, rented a hybrid bike in the UK and cycled the 1 000 miles (1 600km) from Land’s End to John O’Groats – she completed her 13-day trip just six days before the start of Ultra Trail Madagascar. This trip was a graduation present for her son, Cason Crane, who in his short 24-year existence has already run the World’s Toughest Mudder, climbed the Seven Summits, and finished four Ironmans. Then there is Argentinian Sebastian Armenault. He started a charitable foundation, One Mile One Smile, and pledged to run more than 2 500km of some of the world’s most challenging races. Armenault usually comes close to last, but his sponsors donate far more to schools, hospitals and the elderly than race winners receive in prize money. Malagasy runner Revelinot Raherinandrasana has only one arm, and placed 10th in the men’s 1 500m in the Paralympic Games in Rio. Sadly, sports aren’t a priority in Madagascar: Revelinot received no fanfare upon his return, and simply went back to his job washing laundry with his wife in a poor part of the capital. 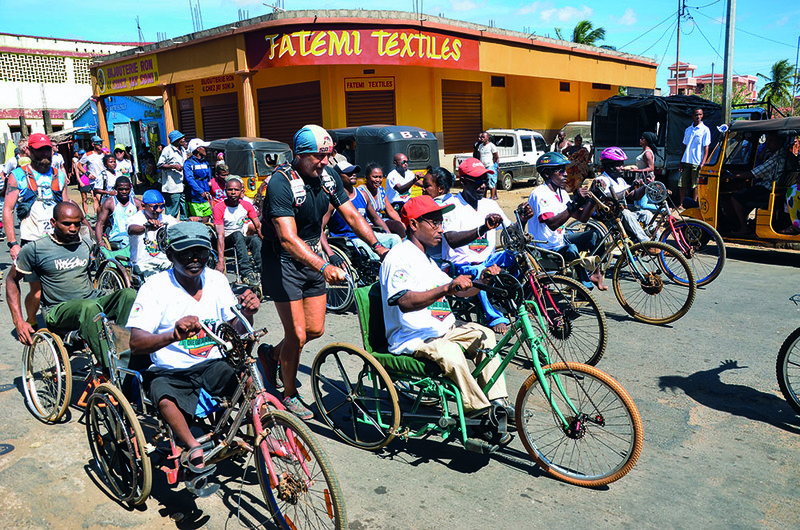 Another Malagasy athlete is Zephirin Zimazava, who is blind. Last year, he only finished the first stage of the race; this year, he will complete all six. The camp is as comfortable as it can be, considering the restraints. Last night I slept on a real mattress. There are bush toilets dug into the ground, showers connected to tanks of fresh water, and although meal times are an eat-what-you’re-given affair, the food is tasty. Still, it’s far from five-star luxury. 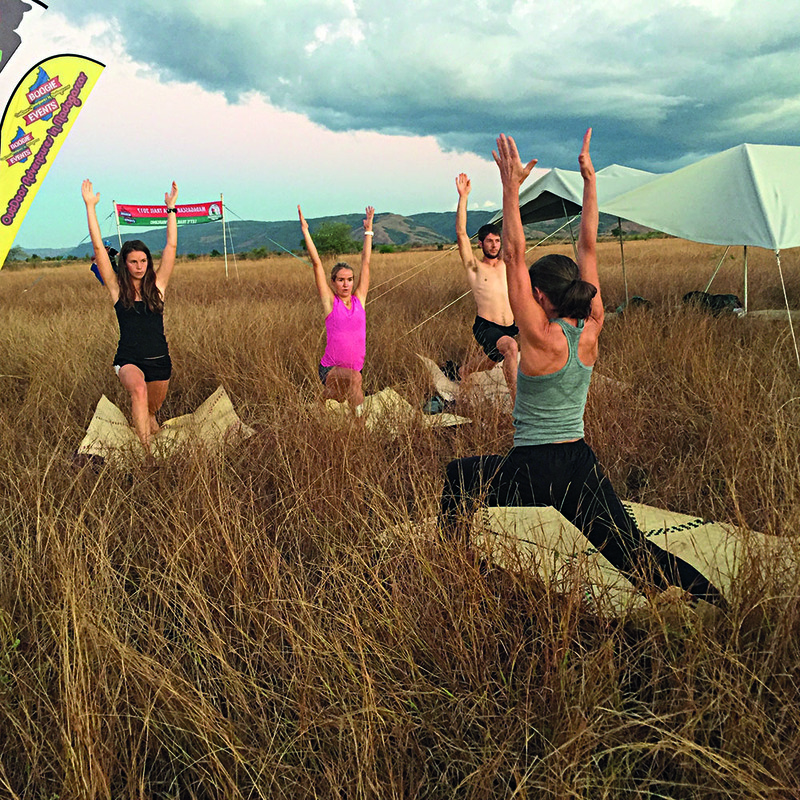 Participants who have travelled here from other countries have paid good money to come on a trail-running holiday devoid of home comforts and modern technology. Over the next six days, I will hike, run, and drive along the route with a team of photographers and videographers, hoping to find out why. 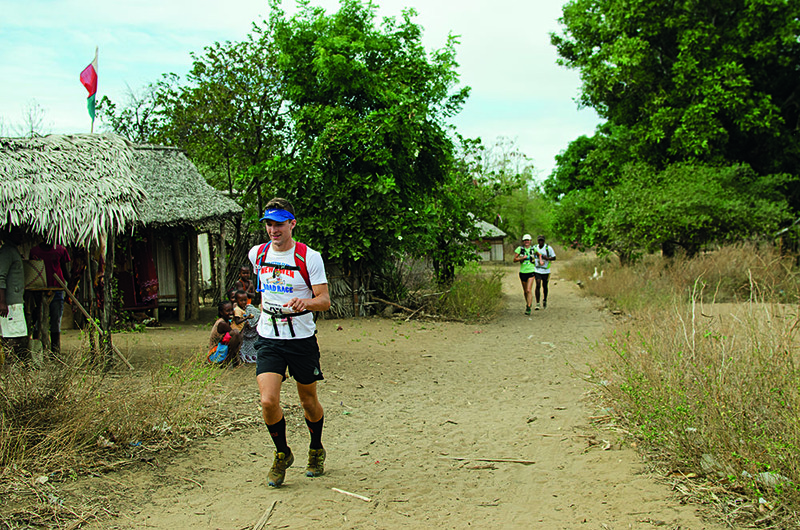 On day one, we hike to the first checkpoint along the same route the runners run. Because it’s the only way to get there. A single track ascends above rice paddies, and then dips back down to babbling rivers. From the top of the hill, we can see the placid volcanic lake of Fanantana. The leading pack of runners swishes towards us through the tall grass. We continue our hike on dirt roads past small farms, where zebu cattle are kept in kraals, chickens peck at the dusty ground and tired dogs bask in the morning sun. Locals live in basic huts made from palm leaves, often raised to allow air in and keep bugs out. Whole families huddle on their porches, staring at us. It’s market day in Anivorano, which is now just a short walk from the second camp. Raw meat hangs from the roof in one stall; others sell punnets of fruit, children’s toys, slip-slops and bed frames – you name it. In a bar, Dan, Christiaan and Cason share a quart of Three Horses Beer (THB). I’m told it’s the most popular in Madagascar. This place is almost untouched by the modern world. Medieval-looking wooden carts on rough, chunky wheels are pulled awkwardly by zebu cattle. Though there are canary-yellow tuk-tuks, clapped-out cars, and ancient cellphones with black-and-white screens. 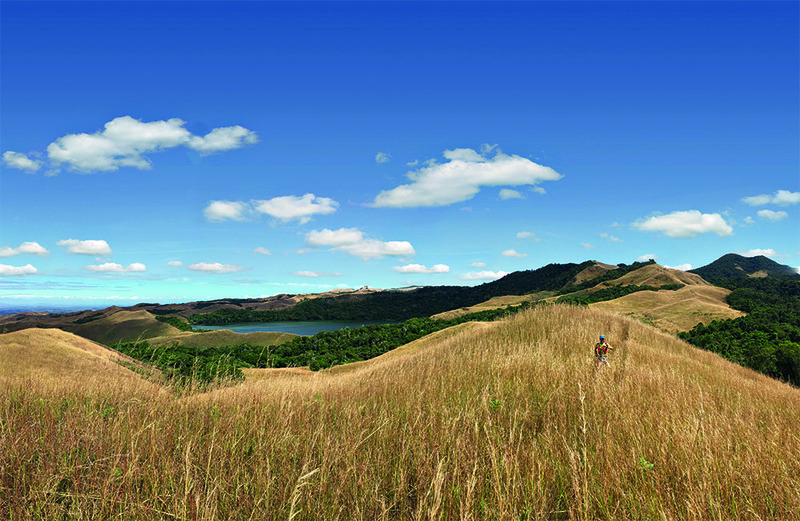 There’s no getting away from it: people who live in rural Madagascar are poor. In part this is because they are separated from the rest of the world by that cavernous gulf in the middle of the country, and the appalling state of the roads means they can’t go anywhere fast; but also because the dry conditions affect agriculture – and that’s a big problem for people who live off the land. Like many African countries, Madagascar has a lot going for it in terms of natural resources; unfortunately, the benefits are outweighed by political instability and economic mismanagement. On day two, runners cross more rivers, and the bridge of Ambodipont, and then make their way towards a safari-style camp on the banks of the Irodo River. He’s right. The landscape in this region changes dramatically, within a matter of kilometres; much of what I see is like nothing I’ve ever seen before. 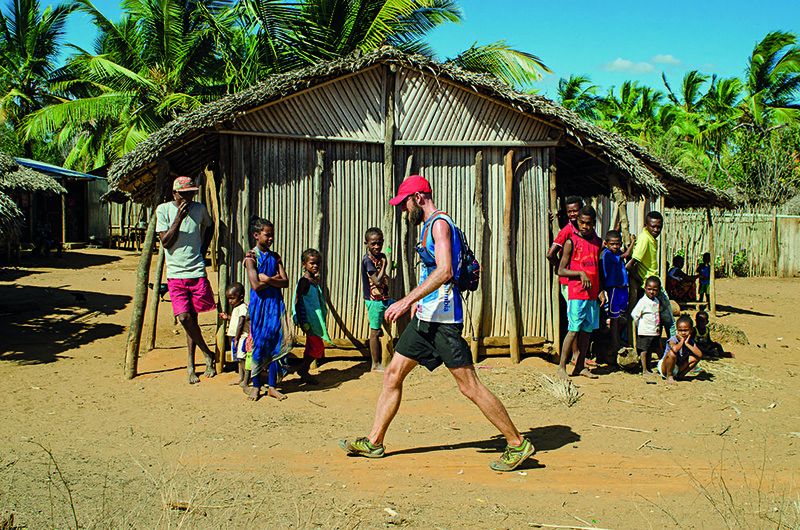 We drive to the Tsingy Rouge – one of Madagascar’s natural wonders – and make our way down into the ravine on foot, where we wait to photograph the first few runners. 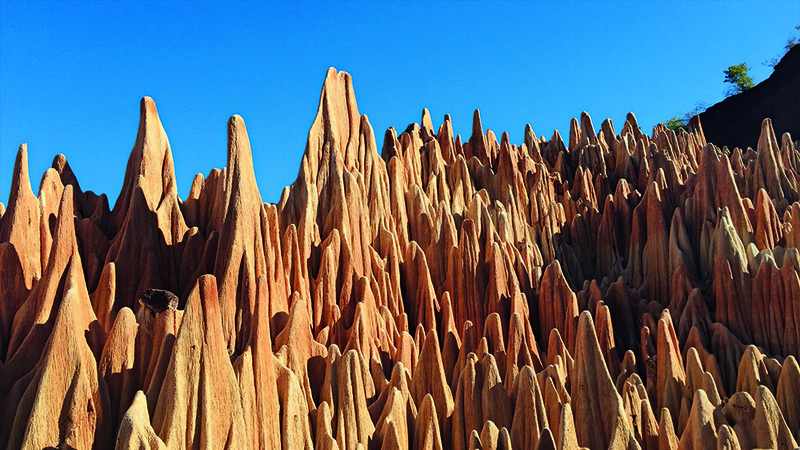 The brick-red laterite pinnacles rise up into the sky like the custodians of the awesome canyons that surround them. From here, I decide to run the final 20km of the stage with Francisco, one of the Malagasy athletes. It’s my first taste of how tough it is to run here: there’s very little shade from the burning sun, and the soft sand covering most of the route is relentless. Francisco and I are connected through running; even though we don’t speak the same language, we’re suffering in the same way. Back at camp, we eat freshly-shucked coconuts from the back of a wooden cart, and sickly-sweet dried bananas. In the absence of cellphone reception and internet access, people are forced to interact with one another for once. The Malagasy and foreign athletes are beginning to forge new relationships. 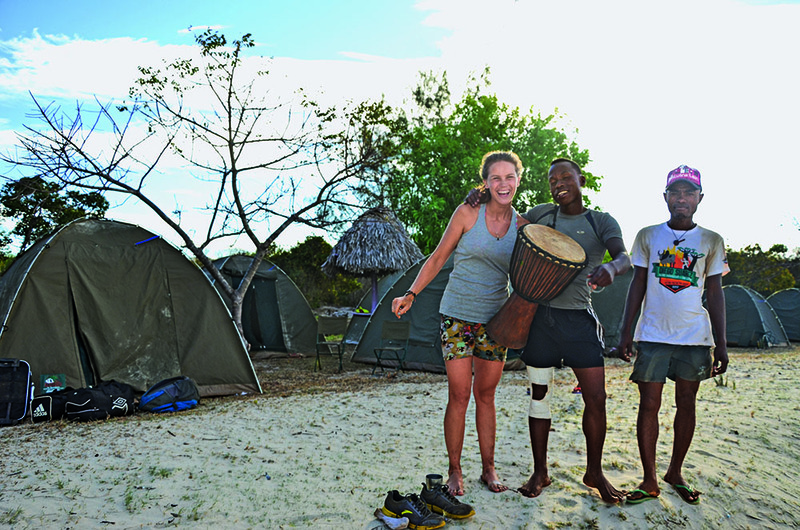 Outside of Sam Campbell (24) – a South African participant, who is also a volunteer at an NGO in Madagascar – none of the foreign athletes speaks Malagasy, and Isabella is the only one who speaks French (the island was a French colony for 60-odd years). Yet we find other ways to communicate. We sing and dance to Malagasy songs, accompanied by drumming. Isabella makes a meaningful contribution to our mobile community by instructing a daily yoga class. An army of villagers from Ankerika form a line at the edge of our camp. There is more staring. “What do they make of us?” I ask Sonja Gottlebe.